Apple has once again petitioned a court to prematurely block sales of Samsung's Galaxy Tab 10.1 tablet before the conclusion of the companies' many patent dispute cases. The US Court of Appeals for the Federal Circuit in Washington determined last week that Apple has to show that it's likely to win this particular patent dispute with Samsung, and that Apple is free to pursue preliminary bans on sales of the Samsung Galaxy Tab 10.1. Apple's previous request to have Samsung products barred from sale before the conclusion of court proceedings was denied in December by California judge Lucy Koh, but the appeals court overturned that ruling. 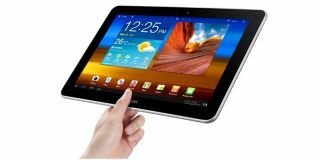 "Gee-sung previously said that he'd offer Apple "no compromise..."
Following the appeals court's decision, Apple filed a request with the court on May 14 that Samsung's Galaxy Tab 10.1 be banned from sale in the U.S. before the end of the case. "The court can and should enter a preliminary injunction against sales of the infringing Galaxy Tab 10.1 without further hearing," Apple said in the filing. "Each day that Samsung continues to sell its infringing Tab 10.1 causes additional harm to Apple through design dilution, lost sales, lost market share, and lost future sales of tag-along products." Samsung's lawyers filed a response today, calling the request "premature" and saying, "Given the severity and importance of a preliminary injunction motion, Samsung should have the right to prepare and submit briefing and oral argument to the court." Samsung issued the following statement to TechRadar: "The U.S. District Court for the Northern District of California decided on May 21, 2012 to proceed with a hearing on Apple's request for a preliminary injunction of Samsung's GALAXY Tab products. The hearing is scheduled for June 7, 2012. "Samsung will continue to actively defend and protect our intellectual property to ensure our continued innovation and growth in the mobile communication business. We will continue to serve our customers, and sales of Samsung products will proceed as usual." Samsung and Apple have brought more than 30 lawsuits against one another in 10 different countries, and the two companies have previously been ordered to reduce their massive claims against one another. But CEOs from each company are currently engaged in court-ordered peace talks. Apple chief Tim Cook and Samsung head Choi Gee-sung sat down yesterday to discuss a way to settle the two companies' difference without further litigation, and their discussions continue today. Gee-sung previously said that he'd offer Apple "no compromise," though "cross-licensing" remained an option. The results of these negotiations are as yet unknown, but one thing that's clear is that a lot of lawyers have become very rich from Apple and Samsung's many disputes.